When I adopted Sharky, my 6 yr. old OTTB from the Equine Rescue, I had to use my heart more than my eyes, as the horse presented to me was not the picture of my dream horse. He ran his last race just 10 months prior to me adopting him, and had been turned out on a farm for awhile before coming to the rescue. He was in horrible condition, practically emaciated, full of parasites and had rain rot from withers to tail, but there was something about the bright chestnut gelding that made him the one to come home with us that day. Perhaps it was the look of determination and spirit in his eyes, or maybe the fact that as we stood in the field amongst 20 other horses and he physically placed himself between us and them, but it was clear that he was our guy. My husband claims that he chose Sharky, but I truly feel that Sharky chose us. We had to leave him that day, as we had “just come to look” and not brought the trailer with us. We made plans to pick him up the following Saturday, and arrived with a trailer full of feed for his enjoyment on the ride home. For just that reason, this poor horse had to endure yet more suffering, as he must have bolted the feed in his hunger, and when we got him home, we discovered he was choked. So then it was off to the vet right away, and over the next 24 hours we were not sure what the outcome would be. By Sunday afternoon, we had good news, he was unblocked. I brought him home Monday, and he was on a strict diet of soaked feed and alfalfa cubes. His first few days were pretty uncomfortable for him, and he was depressed. A small dose of Banamine took away some discomfort and he perked up and started eating well. Medicated baths every other day began to make the skin condition disappear, and his true sweet personality and gentle but playful nature emerged. I started him on groundwork, learning to supple and give to pressure from the lead rope and my hands imitating leg pressure on his sides. I could tell that he was very stiff and wasn’t used to flexing, but expected that from an ex-racehorse that was never taught to bend. In his lunging work I could tell that he had basically good movement, but he was still pretty “off,” not moving very fluidly or smoothly. As he gained weight and his muscles developed, he began to get better, but still seemed a bit stiff to me. About six weeks after I brought him home, he had gained enough weight for me to be able to ride him. He still needed more, but he had a good covering over his ribs, and his topline had filled out tremendously. We started out slow and small, and worked our way gradually to faster gaits. I worked him quite a bit on flexing and suppling, but always seemed to meet with some resistance. When I would give him a leg cue, he would swish his tail, and lateral movements were very clumsy and choppy. Considering his past training, I simply assumed that it would just take some time for him to learn to soften and supple. 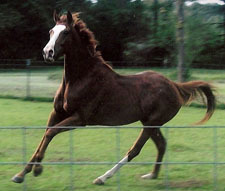 At the trot, he would have very brief moments where his frame would be soft and round, but otherwise his back was hollowed, head up, and his gait very choppy. Each time I would ask for the canter, he would throw his head up and also buck a little with ears pinned and tail swishing. It seemed impossible for him to pick up his right lead, and even on the left lead, which was more comfortable for him, his canter felt like his whole body was disarticulated and the movement was far from smooth at all. I began taking him to my riding lessons, hoping that an experienced trainer who had worked with lots of OTTB’s could help me. Exercises over poles only seemed to make him worse, and my instructor suggested that he might have an issue with his right stifle. The last two lessons I had we had to cut short because he just was not moving right at all. Over the months, he gained weight and filled out, becoming more beautiful every day. However, his schooling was not progressing at all, and I became discouraged, and my dreams of flying over cross-country courses and long, relaxing trail rides seemed to fade into impossibility. I did research. I contacted every trainer from his racing past to see if he had encountered any severe injuries that would explain these issues. He wasn’t necessarily lame, just “off” in his movement, and he felt terribly uncomfortable to ride. The trainers reported nothing, not even a stubbed toe. One thing I did look at was my saddle. Now a year after I adopted him, he had gained nearly 400 pounds and his body musculature was very different due to the work he was getting. I tested my saddle and examined it closely and thought that might be part of the problem, so I began my search for a new, better fitting saddle for the horse he was now. As I was searching the internet (there are no tack stores in my local area that stock English saddles), I ran across an email that was posted on one of my lists for a saddle sale. That email happened to be posted by Pam Sourelis, who was an animal communicator, Reiki practitioner, and practitioner of Neuromuscular Retraining. I checked out her website, as I am familiar with animal communication and Reiki, having used services like these in the past with other animals of mine. I thought to myself, I really wish I could just ask Sharky what’s wrong; that would be so much easier. So I contacted Pam about a communication with Sharky, and she suggested we try the Neuromuscular Retraining. Pam explained to me what NMR was and how it worked. [Pam’s note: Neuromuscular Retraining is movement reeducation based on the Feldenkrais Method of movement reeducation for humans.] At first, I had my doubts that such a thing was even possible from a distance, and how could it work? It sounded far-fetched, but I had exhausted as many traditional veterinary treatments as I could afford. The rate that Pam charges is very reasonable, so I decided it couldn’t hurt, and if it worked, it would be worth every dollar spent, and ultimately be less expensive, and less traumatic for Sharky, than what I had already spent on bute, steroids, corrective shoeing, etc, and losing the use of my horse. In the end, I am so glad we did this. The results have been amazing and I fully believe that Pam’s work made a huge difference. I would highly recommend Pam’s services to anyone. Pam did three sessions with Sharky, one session a week for three weeks. Since his case seemed so severe to me, I waited until all three sessions were completed and his nervous system had time to process the new information and his body to respond before I asked him for some work. We did do some hand-walking a few times, though. About four days after his last session, I did a formal lunging session. I asked for all three gaits, and it was like I had a totally different horse! His movement seemed so free, unrestricted and fluid, I could hardly believe my eyes! I was almost mesmerized, just watching him float around on the lungeline, I could have watched him move like that forever. I asked him for a canter, and the transition was so smooth it was so beautiful to see. I could see him rounding his back and lowering his head, even on the lunge, and that was something he’d never done before. I asked him to move his rear end, and then his front end; I asked him to sidepass and back up. All these movements he did with the most beautiful fluidity and softness, and there was no resistance or tail swishing or ear pinning at all. Two days later we had our first ride after Pam’s three sessions with Sharky. I had my new saddle and had fitted and re-fitted it several times to make sure it was right. I mounted and we walked off. So far, so good. He was relaxed and soft. Then I asked for a trot. He still felt relaxed and soft, and was keeping a nice round frame for much longer than I remembered him able to do before. His strides were longer and smoother and he was really engaging his hindquarters. This was so great, I almost stopped right there. However, I just wanted to see what his canter felt like, I could hardly contain myself. So I asked for the canter. There was no bucking. There was no tail-swishing. There was no ear-pinning, and there was no feeling like I was rolling down a hill inside a barrel on an unfolded lawn chair. It was smooth. It was rhythmical. And he had picked up his right lead. I truly wish I could remember every detail of those few minutes of that canter, but honestly all I could see was a white light and it felt like I was floating on air. I could sense the horse under me, with the steady three-beats of a canter, but the feeling was so exhilarating, it’s really hard to focus on what it felt like in the physical sense. Since that first ride, post-Pam, we have ridden twice more. Our riding time is limited right now due to extreme heat and humidity here in the South. Each of those rides has been as good, if not better than the last. Sharky is continuing to improve. We still have a long way to go, as he is still a green horse, and we have lots of work to do. But now, I feel hope where before I felt despair. I was very upset over the thought of this horse, whom I have totally given my heart to, might be only suited as a pasture ornament. I wanted so much to enrich his world by sharing with him the beautiful wooded trails and open fields that truly make riding fun for a horse. We have been on a few trail rides and I know he really enjoys it. He has a wonderful intelligent mind and a competitive spirit and so I wanted to present him with challenges so that we both can have something to look forward to. I had visions of jumping again, which is my passion, and maybe trying to delve deeper into dressage training and perhaps competition. I could almost feel the wind in my face as we galloped across the fields over fences and perhaps with a hunt. I also could see the ribbons that we might win together at some local shows for some friendly competition. All this can only be accomplished with a willing and trusting and capable partner, which I feel he has it in him to be, and I also to him. All those visions evaporated when it looked like Sharky’s vague but definite lameness wasn’t getting better. I wasn’t sure that traditional medicine would be able to cure him, as it had produced no results with extensive treatments and simple rest. Sharky is my first horse after a span of 15 horseless years, after my beloved friend and childhood partner died in 1994. I think we chose each other to share the journey into the next phase of both our lives. Thanks to Pam and her exceptional work, I feel like the journey will be long and fruitful.